This month we are handing over to another guest blogger – Prabha Parthasarathy – who was a winner of the Partnership Tutor Fund in 2016/17. You can find out more about the Partnership Tutor Fund on the ADQE webpages. On 31st March this year, a networking lunch event was organised at the Friston Building. 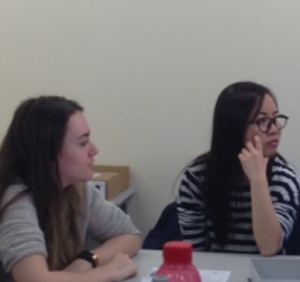 Funded through ADQE, the main purpose of the event was to enable foundation students of the Study Group, to get a flavour of University Life at Sussex. In addition to Study Group foundation students (of the Life Science Pathway), the event was attended by current Life Science students, Heena Jagatia-Ph.D student , myself-Link Tutor for Life Science pathway, Kristy Lascelles- Subject Leader- Study Group and Sandamalee Senanyake- Biology Tutor, Study Group. In this fun yet informative session, Heena Jagatia, a Ph.D student, gave a talk on her career timeline, highlighting her laboratory achievements. This was followed by a talk by Elmi Dahir, a former Study Group student, now a third year B.Sc Biomedical Science student. His lively talk included some of the stimulating experiences at Life Sciences. 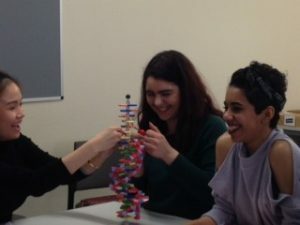 In addition to talks, study group students had the opportunity to build a DNA model and during this time , they interacted with first year Life Science students. They soon became comfortable and were invited to attend a lecture taken by Prof Jonathan Bacon, Teaching Award Winner -2017. “having conversations with first year students gave me an overview of the different courses and the opportunities we get such as shadowing and summer internships”. “students talking about their passion and dreams made me feel inspired”. We hope that this small step will go a long way in promoting our goal of inclusive learning at the University. What is a learning outcome? And why do we use them?